Reading and share top 11 famous quotes and sayings about Blood Sweat And Tears by famous authors and people. 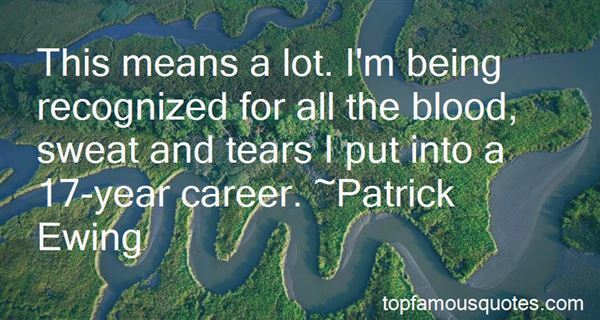 Browse top 11 famous quotes and sayings about Blood Sweat And Tears by most favorite authors. 1. "It took a lot of blood, sweat and tears to get to where we are today, but we have just begun. Today we begin in earnest the work of making sure that the world we leave our children is just a little bit better than the one we inhabit today." 2. "We constantly fight an unseen enemy. God has assured us the victory, but He has told us to take an aggressive stand against the evil one, covering ourselves in His armor. We're going to win, but victory is going to take blood, sweat, and tears—His blood, our sweat, and tears from us both." 3. 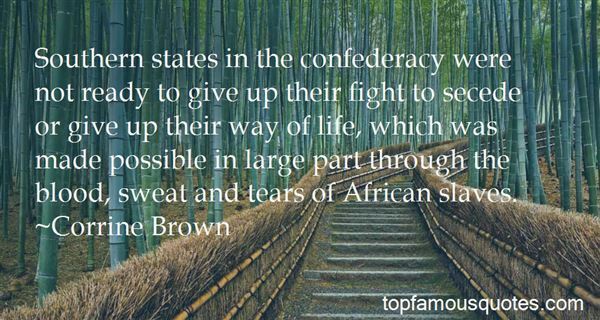 "Southern states in the confederacy were not ready to give up their fight to secede or give up their way of life, which was made possible in large part through the blood, sweat and tears of African slaves." 4. "Kids take work, effort, love, blood, sweat and tears and are a full time job. You have to commit, for better or worse and then give your all and hope for the best. The one thing you can never, ever do is give up and say, 'Oooops, never mind, my bad, you can take this one back!'" 5. "But in a way you can say that after leaving the sea, after all those millions of years of living inside of the sea, we took the ocean with us. When a woman makes a baby, she gives it water, inside her body, to grow in. That water inside her body is almost exactly the same as the water of the sea. It is salty, by just the same amount. She makes a little ocean, in her body. And not only this. Our blood and our sweating, they are both salty, almost exactly like the water from the sea is salty. We carry oceans inside of us, in our blood and our sweat. And we are crying the oceans, in our tears." 6. "Honestly, what the hell is destiny going to want from me now?" "The same as any endeavor. Blood, sweat, and tears." "That's it," Tohr said dryly. "And here I was thinking it could just be an arm or a leg." 7. 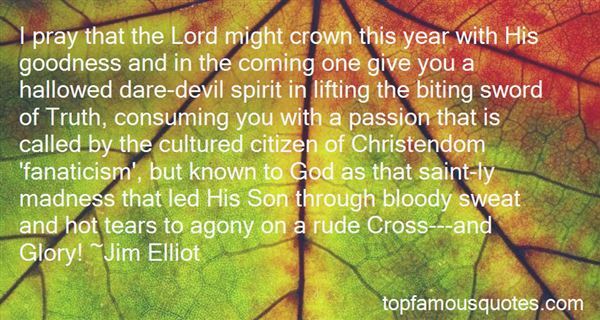 "I pray that the Lord might crown this year with His goodness and in the coming one give you a hallowed dare-devil spirit in lifting the biting sword of Truth, consuming you with a passion that is called by the cultured citizen of Christendom 'fanaticism', but known to God as that saint-ly madness that led His Son through bloody sweat and hot tears to agony on a rude Cross---and Glory!" 8. "Never forget the blood sweat and tearsThe uphill struggle over years the fear and, trash talking and the people it was to, and the people that started it just like you"
9. "Love is what brings you together, Lucy. But it's the blood, sweat, and tears of hard work that keeps you together"
10. "This means a lot. I'm being recognized for all the blood, sweat and tears I put into a 17-year career." 11. "If you hire people just because they can do a job, they'll work for your money. But if you hire people who believe what you believe, they'll work for you with blood and sweat and tears." Silence across the field. When they reached the edge of the forest, Claire's anxiety faded. It really would be easier"